The Handbook of International Political Sociology edited by Xavier Guillaume and Pinar Bilgin has been published. 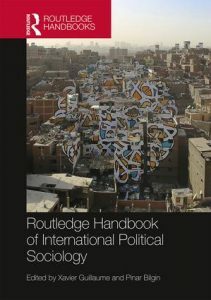 The handbook provides a survey through the multi-dimensional field of international political sociology, explores core issues, theories and methods as well as the connections to cognate disciplines. It will become a useful resource for students and scholars and further strengthen the field. In my own chapter I discuss the practice turn and its methodological implications. Preview the book here.